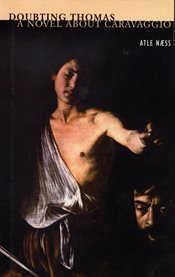 The item Doubting Thomas : a novel about Caravaggio, (electronic resource) represents a specific, individual, material embodiment of a distinct intellectual or artistic creation found in Richland Library. Coming somewhere between Peter Ackroyd and Perfume, Doubting Thomas is an innovative and fascinating novel about the renowned Italian painter Caravaggio. The plot centers around the events of a May evening in Rome in 1606, when Caravaggio was challenged to a duel and killed a man. Who was this man Caravaggio? What happened on that fateful night? What was the cause of the fight that forced him to flee Rome? Different narrators, including a drunken architect, the painter's own brother, some ladies of the night, a town clerk, and a close friend of Caravaggio all present their versions of the events that took place that night, shedding light on what happened and, as a result, on the painter's revolutionary art. Doubting Thomas is a book about ideas and about a period in time that witnessed the coming of enlightenment and dramatic changes in thinking. It is first and foremost a novel about human destiny, sensuality, and purpose of mind; brutality and love, exploration, and devotion. How far can a painter go? Where is the line between what is sacred and what is profane? How can a drunkard and a womaniser such as Caravaggio create art that speaks of fervent aesthetics and even religious devotion?